One could easily dismiss this ad as a typical creepy caricature from the early 20th century. However, once it is realized this is a British ad from 1917 — right in the heart of World War I — it gets extra-quintuple super creepy! 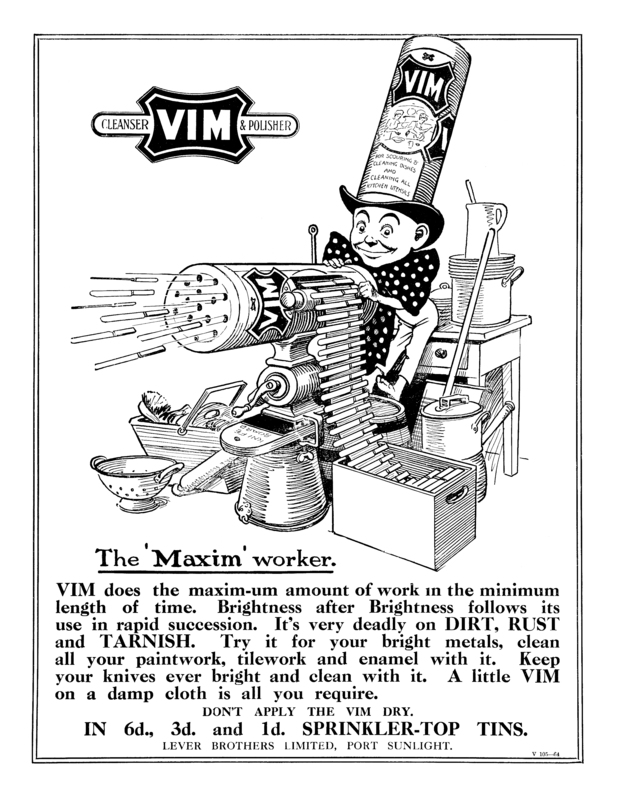 While it is well known many early ads could be quite insensitive (even aside from those that were racist and misogynistic), just imagine today if there was some sort of cleanser advertised as if it exploded brightness on the floor like an IED or chopped the head off dirt like the Daesh. That’s pretty much the context we have here especially since the British and Allied Powers were as much on the receiving end of machine guns as they were giving it out to the Germans and Central Powers. Posted in 1910s, History, Retro/VintageTagged advertising, British, cleaner, cleanser, Great Britain, illustration, machine gun, United KingdomBookmark the permalink.